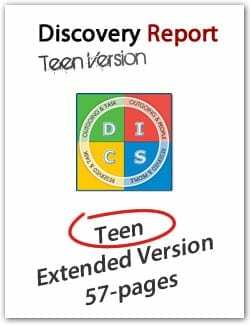 The Teen Extended Discovery Report version is what we call our “Get Real” version. You will receive a personalized 58-page DISC profile report that is highly accurate and easy-to-understand. The Discovery Report is based on the results of an online personality test (assessment) that will take you only about 15-20 minutes to complete online. Some may think of this as a “personality test” or a “personality quiz.” This is not really a test, because you can not fail. There are no right or wrong answers, just your individual preferences. The report is divided into four sections. One section for the teen, one section for the teen’s parents, one section for the teen’s teachers and one section with vocational information. This vocational aspect of this report is great for teens trying to figure out their strengths and how to leverage them for a future career. A new bonus has been added that will allow teens to use a special “Career Interest Explorer” tool that will allow them to narrow down a list of careers that fit them according to their personality. The career list can be saved for later reference. Teens can even research the careers by clicking on links which we have organized to be very easy to use. There is no extra charge for use of the Career Interest Explorer. Get your very own Discovery Report today!